Opening Paragraph: Helena stood upon the ship's deck and surveyed the army sent to kill her. Before her stretched the harbor of Judea's provincial capital, Caesarea. The city was rimmed by hills, and the hills were crowned by temples and palaces. The might of old Rome was firmly established here, and it was her enemy. 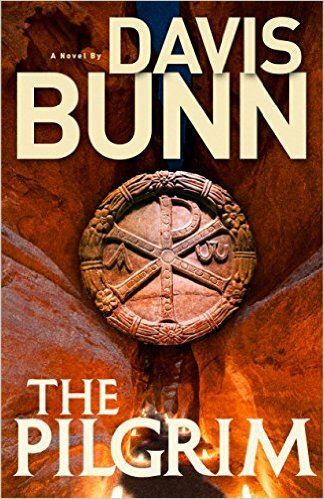 Synopsis: In his latest historical epic, worldwide bestselling author Davis Bunn takes readers on a journey through an ancient landscape. Travel with Empress Helena from Caesarea to Judea. Abandoned by her husband, in danger because of her faith, but with an implacable will to do what God calls her to, she takes a perilous pilgrimage. Along the way she meets those who would help her (the wizened and wise bishop Macarius; the rough-edged but kind-hearted sergeant Cratus; the young soldier Anthony, a man who has lost everything, including his faith) and those who would harm her (the menacing and murderous Roman assassin Severus). Miracles seem to follow this humble but determined woman as she wins many over to the faith, and changes lives forever—including her own. This unforgettable story of the discovery of the True Cross will thrill readers with its adventure, and with its vivid portrait of one of Christian history’s most important women. The Pilgrim is a brief novel (165 pages) Helena, a wealthy Roman noblewoman who was cast by her high ranking husband. In accordance with her heaven-sent visions, she travels to Judea where she could be executed for being a follower of Jesus Christ. As assassins tail her and her small group, other followers and believers of Jesus join up with her and her army slowly grows. The setting is the Holy Land during the 4th century. This small but powerful novel is about the courage and faith of Saint Helena and the forgiveness of sins. It is a tale about the True Cross, told by a master storyteller who knows how to engage the reader with his simple, but powerful prose. With each page, Davis builds tension with dangerous circumstances and fascinating characters. This unforgettable story is highly recommended!